Mitigation of bycatch in coastal gillnet, longline and prawn trawl fisheries. 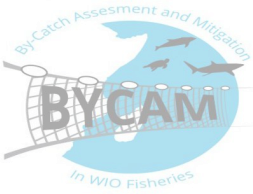 The BYCAM project, funded by the Western Indian Ocean Marine Science Association (WIOMSA), brings together expert biologists, social scientists, interdisciplinary researchers and stakeholders, including fisheries managers, fishers, and government and non-government representatives. Aim: To assess bycatch and redevelop economically viable methods for mitigation of non-target mega-fauna species bycatch (retained or discarded) in artisanal/small-scale commercial gillnets (drift-and bottom sets), longlines, and semi-industrial prawn trawl fisheries in the WIO. It is the first comprehensive study in the WIO that focuses on bycatch assessment (through quantitative approaches) and reduction towards sustainable levels through effective mitigation, good governance and providing recommendations for effective management. Ensuring that those that will be impacted socially and economically are consulted and their advice sought about how bycatch could be reduced and how such management measures are likely to impact their livelihoods are key for policy reform. The research offers an opportunity for the WIO to develop processes that positively affect the livelihoods of marine resource users as well as taking a step towards securing environmental sustainability and ecosystem stability for the future through focused and interdisciplinary research.